The Daisys ask where is the bathroom???? 1-11-08The docent was showing some Daisys (kindergardeners)around the museum. When it came to the minature doll house, the docent told the girls that the house was just like a house of 1912, the year that Girl Scouting started. She asked the girls is there anytning different in houses today. The girls said immediatly "Where is the bathroom". The girls and women were not allowed to vote at that time. 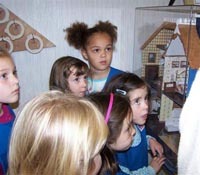 There are more pictures in the Girl Scout Museum page and Fay's Page in the blog section. The Girl Scout Museum has one of the premier Girl Scout Museums in the country.